First off, feel free to share this post on Twitter, Facebook, Myspace, etc. As you may have heard (or deduced from the giant ad on the right side of the page), I wrote a book last year. If you haven’t yet, you should read it. My mom says it’s great. I’m giving away 10 hard copies over on Goodreads. Option 1: Feel free to enter the contest. Option 3: Pay full price at any of the fine retailers on this page (thanks, in advance, for supporting my Dr. Pepper habit): http://www.joshwoodtx.com/godswillbook/. Don’t worry, it’s really short. “About a week ago, I found myself floundering with what is God’s will for my life. That very same day, on the Goodreads giveaway page, I found this book, How to Find God’s Will listed for a giveaway. It felt like an answer to my prayer, especially after I won it! It arrived today and I read it as soon as I received it. It is a short book that packs a big punch! I loved this book. It felt like Mr. Wood knew what was on my mind and set to addressing each of my questions/concerns in his 3 step approach. He offered a very practical answer to my questions “how do I know what God’s will is for me?” – answer, Be Like Jesus. So obvious and yet so hard to figure out. His writing style is down to earth and fun. I enjoyed his stories that were filled with self deprecating humor. The cover of the book alone was quite funny (you must read the reviews on the back cover!). I liked the author and I suspect in his church/community, he is someone others can go to for advice. “My wife received this book for free for her honest review. I read it when she finished, so I will now give it MY honest review. I had to set this book down several pages in. I was laughing so hard I was almost in tears. He writes about the things my teenage daughter makes fun of me for, so reading this book was like sitting and relating to a good friend, someone to justify how you feel and share in a common bond. But when the message grows more serious, that bond remains. Josh Wood writes with great humor as well as keen insight. The message is simple, yet so profound. I feel this would be a great book for new Christians as well more long term comfortable Christians. I really hope there will be more to come from Josh and the next time, we may even pay for his book. 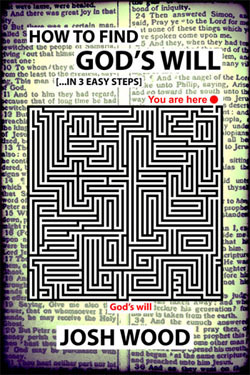 “How to Find God’s Will: …in 3 simple steps by Josh Wood was a quick read. From which I came away with the feeling of spending time talking with a friend after reading it. It is is written in plain and simple language simple enough for anyone to understand. I enjoyed the humor he used to get the point across – “My Will vs. God’s Will” . I will read this one again! I would recommend it to anyone wanting to improve their life. “I won this book in a giveaway here on GoodReads. It is a very short book – about a 20-minute read. “I often struggle with knowing God’s will and this book was a quick read to remind me of and get me back on track to what is really important…living like Jesus. Don’t get so overly involved in yourself! I definitely saw myself in the author and enjoyed his sense of humor. I will recommend it to my pastor and church family. “Josh is entertaining, insightful, and concise. It’s a quick, but worthwhile read. “I was particularly excited to win a review copy of this book. I love self-help books, and knowing God and understanding what his will is for me is difficult, so yay, what a perfect book! “Many times we make our walk with God more complicated than God designed it to be. Josh’s book is such a refreshing, practical and straight forward approach to better understanding God’s will in our life’s circumstances. Life is really not designed by God to be hard to live within the parameters of a loving and forgiving Heavenly Father. The writing style is very welcoming as anyone can relate to the author’s many examples of our typical approach to striving through daily situations. It’s good to just pull back and laugh at ourselves sometimes. “This book is not only small enough to read more than once, but the content creates an inner dialogue that makes you want to read it again just to make sure you won’t forget the lessons. This isn’t one of those self-help, self-glorifying, quick fix books. The “3 simple steps” are simple to understand, but will require intentional, out of your comfort zone actions that followers of Jesus are suppose to do anyways. Convicting, but the steps are ‘easy’ enough to implement into anybody’s lives. God’s Will doesn’t seem so far away after reading this book. Biblically based from the first to last page, with a side of innocent sarcasm! I couldn’t recommend it more. “Great little (33-page) book. Loved the sense of humor…felt like Josh is someone I’d like to know. I could totally identify, having presented my share of flannelboard lessons in Vacation Bible School myself. The nice thing about the book is that is it short and gets quickly to the point. No multiple chapters droning on and on, belaboring his points. Nothing groundbreaking there, but who can read it and not be convicted by at least one of these points? “I picked up this book not because it came highly recommended to me, but because Josh Wood has been highly recommended to me. While I don’t know him personally, we share many friends in common as he now attends the church where I grew up. Through conversations with friends who still attend there, his name has occasionally come up as a great man with a great family who is doing his best to follow God’s will for his life. Based off those conversations, I’ve perused his blog a time or two, and when I saw that he had put out a short book on the topic of finding God’s will for your life, I was intrigued. When I noticed it was short and cheap, I was even more intrigued, as like most people I am strapped for cash and have a to-do and a to-read list which are constantly competing to out-grow each other. Then I got a new Kindle and some Amazon gift cards for Christmas, and I knew I needed to check out this little book. The first thing I noticed about the book is that Josh is a great storyteller, which makes the book fun and enjoyable to read. I laughed a lot as I read through these pages, which was a welcome relief from most books in the field. For some reason it seems readers have to make a choice: do I want to read for self-improvement or for enjoyment? This book allows you do to both for a change. The second thing is that Josh is a normal guy. He isn’t a guy who has locked himself in a room the past 15 years to memorize the Bible in the original language so now he can tell us all what every word of every phrase of every sentence means. 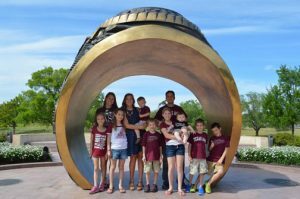 He’s a guy that works a normal job and comes home to his (large) family, but still finds time to grow in his faith and seek God’s will for his life. As I read, I kept thinking, “Yep, been there, or “I do the exact same thing!” as Josh recounted episodes from his experience. And it is precisely this that makes him a guy worth listening to on the topic: he experiences this challenge on a daily basis, and this book is his way of taking what he has learned and trying to share it with others who it may help.